As we drove into Boryeong I admit I was a little confused. Everyone looked so clean. A small smear of brown here and there on legs and arms were the only indication that we were nearing our destination and might find what we were looking for. Its 3pm on a sunny Saturday afternoon and we came here for mud! 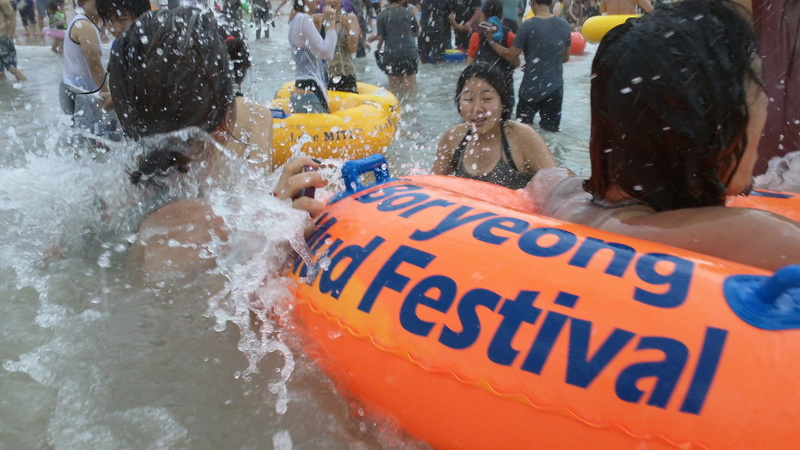 I had heard about the Boryeong Mud Festival before I came to Korea. A friend (now in Azerbaijan) discovered it online and told me about it before I left. She said I had to go. I agreed and even packed my festival favourite ‘I ❤ MUD’ T-shirt for the occasion. 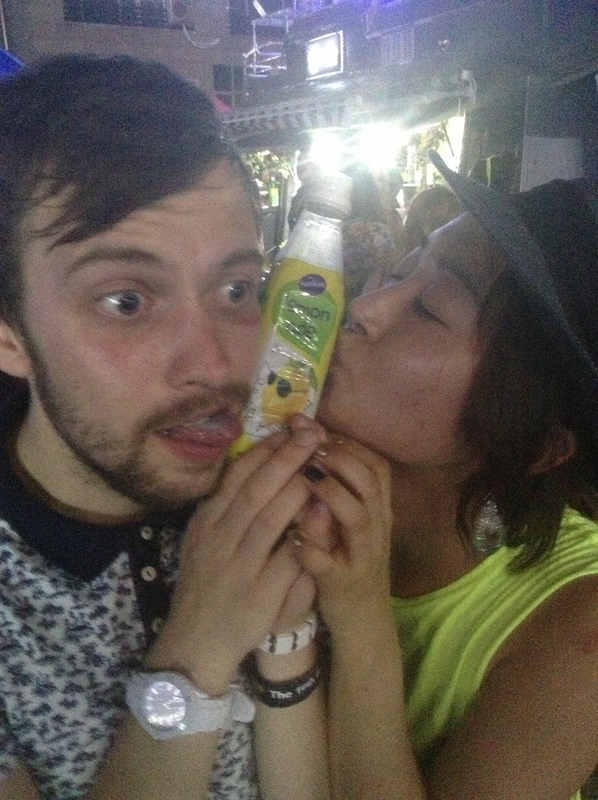 As the festival approached, however, I had all but forgotten about it and it wasn’t until a confusingly named Korean friend, Alejandro, messaged me on a Thursday night, that I remembered. He was driving down on the Saturday morning and had a few spare car seats. 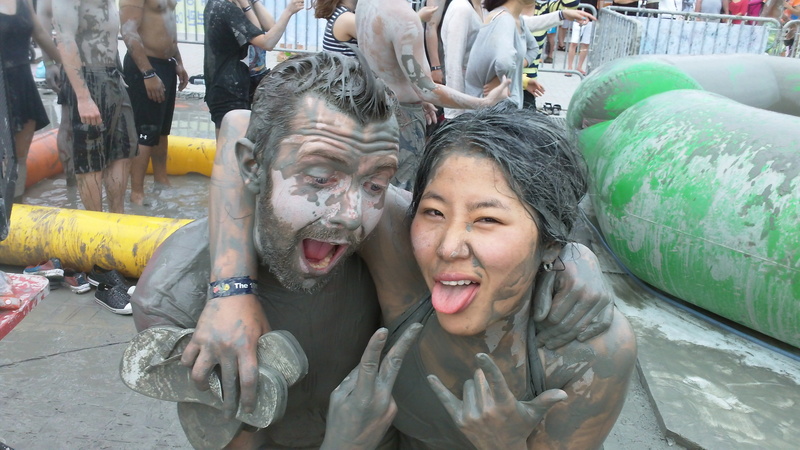 I convinced the newest teacher at my Hakwon, Josh, to come with absolutely no trouble after showing him a picture of about 30 people in a mud wrestling pit, and I called my friend and language exchange partner, Mira, to come along too. And now after a three hour drive we had reached Boryeong. We found our room for the night (and I do mean room, not beds or furniture, just a floor, a sink and a pile of blankets), and we changed into our mud clothes. I should explain before you look too closely at the photos (might be too late) that the night before, Josh and I had been out drinking in Bupyeong until unwise ‘o’ clock in the morning and when we woke up and got ready, to the tunes of Toots and the Maytals, we were still a little tipsy. We were still a little tipsy as we left the house to meet Mira and decided to find some one-use swimming shorts that we could get muddy and trash afterwards. In our infinite wisdom we decided that price was more important than appearance and left a store with shorts costing only 6000won (about £3.50). Nice. What we had could only be called hot pants. Mine were bright orange with a skull and crossbones logo whilst Josh had gone for bright yellow with a pink logo. At the time we were quite chuffed with our cleverness and money saving smarts. 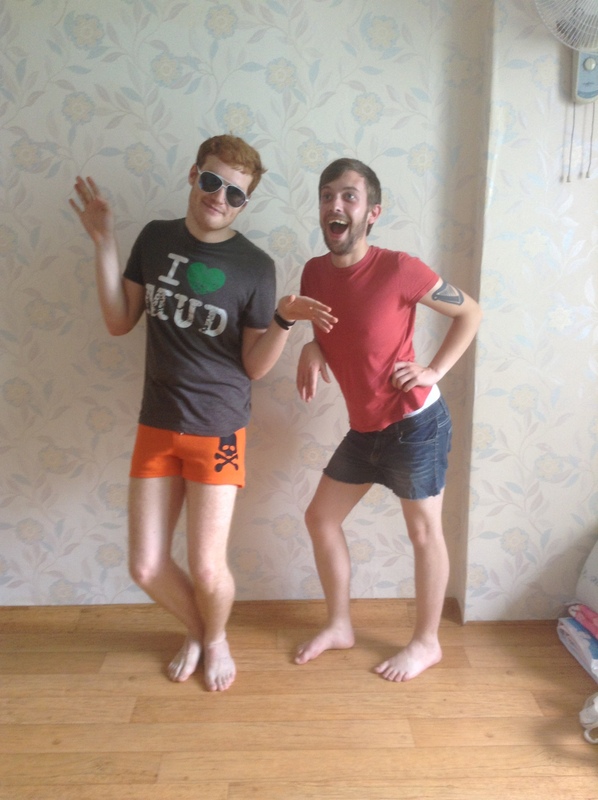 When we got them on, however, we realised that both our shorts and ourselves were about as uncool as it is possible to be. We left the room and were greeted by sunshine and people in gender appropriate clothing. 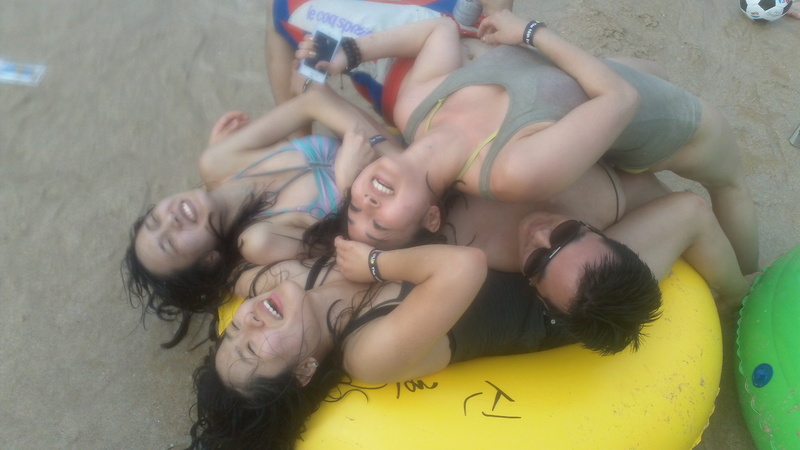 We went to the beach and met three of Alejandro’s friends; Sophie, Amy and Ho Jun. We spent the weekend with these guys and they were great people to party with. All together, it was time to mud! And did we mud. We started by covering ourselves and each other from head to toe, first gently but very soon chucking handfuls of the stuff at each other. It was good mud, watery and smooth, though it didn’t taste too good. Within ten minutes we were barely recognisable. The festival lasts two weeks and they set up huge inflatable mud slides, obstacle courses and wrestling rings for the event. We grabbed some (overpriced) beers and got our tickets for the mud festival arena. The festival has a reputation for attracting swathes of foreigners and they (we) were certainly out in force, but I was happy to see a large number of Koreans there too. As usual it was mainly Americans and many had the close cut hair of soldiers. Mud wrestling. Why, oh why have I never decided to cover myself in slippery mud and wrestle before. Our first stop inside the arena was the mud wrestling pit. A thick mat had been laid down under the pool to (barely) absorb the impact as tens of people were floored by friend and stranger alike in a frenzy of cheers and challenges. One minute I’m having a 1-on-1 with Alejandro and the next I’m being wiped out from behind by a hooting stranger. Sophie and Mira got stuck in too and didn’t take any prisoners. After ten minutes I was shattered, winded and smiling from ear to ear. At one point everyone went silent and ducked instinctively as the Korean Black Eagle display team flew inches overhead with a supersonic boom and a tremendous cheer from the muddy crowd. After the mud wrestling came the mud prison, where you get mud chucked at you by the bucket load, the mud obstacle course, and once the mud wrestling pit was closed, the ‘clean police area’. The place was closing down around 5.30pm and the soft mats had been cleared, leaving about an inch of mud on the floor and one hundred people looking for something to do. A cheer went up and a very clean person was lifted by his friends, deposited on the ground and quickly mudded by the people closest to him. A happy mob mentality formed as friends and strangers dragged friends and strangers from around the place into the area. Everyone seemed pretty happy to go along with it and I should point out that anyone who looked like they wouldn’t be too happy with it was generally left alone. One couple of older women in life jackets were left alone until they made a fuss that they were being left alone, the cheer went up ant they were quickly mudded too. I didn’t do too much of the mudding but I took great pleasure in spotting the incoming ‘clean’, pointing and starting the cheer. 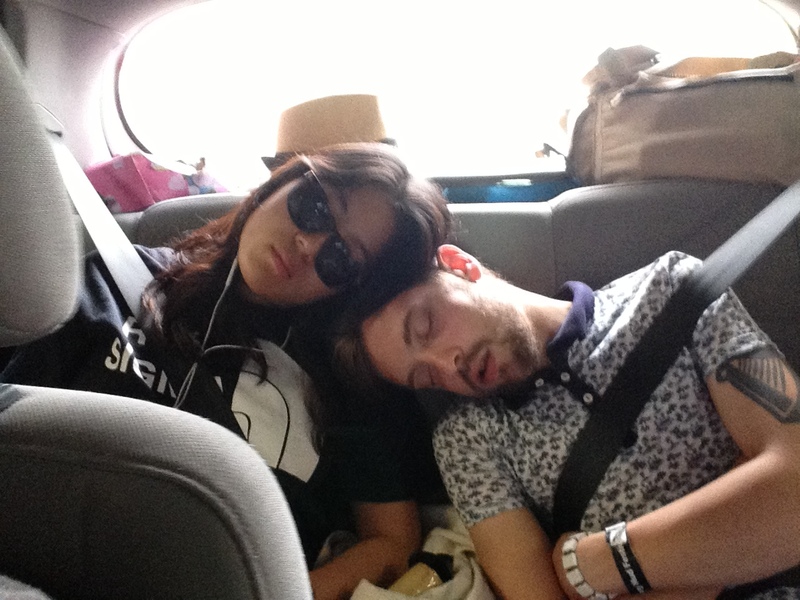 There was a good festival mood as we left the arena and headed to the beach to wash off. It was still hot and sunny around 6pm when we got down to the beach. I was ready for the cold water, I had mentally prepared myself on the short walk from the arena to the crashing waves. I’m English, I’m trained to deal with stupidly cold sea water, it’s what we do. I know well that it starts like a bucket of ice and then your body goes numb to it and everything’s fine until you either get out or freeze to death in the water. I ran in, holding my breath and bracing myself for the felling of a million tiny piranha tearing at my skin. I was not ready for it to be warm, it was more of a shock than the cold would have been. It was like being in a salty bath with about a thousand other people, jumping at every huge wave that crashed into the beach. The swell was easily five or six feet and the waves were merciless but people were carrying on and taking the beating. Some (like us) even rented rubber rings and rode the huge waves on these. My ‘I ❤ MUD’ T-shirt, which I had made my peace with before the festival, accepting that this was one festival it would be proud to die at, was clean in minutes , along with the rest of me. After a little while in the waves and water, it was time for some more beer. Alejandro had also brought a football with him and we played a game on the beach, using the rings as 360° goals. This is the first time I had played football in my memory, its easily been over 10 years since I even had a kick about on the park (I don’t do football). I surprised myself by enjoying it a lot but after 20 minutes I could barely breath and my feet were battered and bruised. After the first half, Sofie, Mira, a guy called Jeff and I were losing 3-0 against Amy, Josh, Ho Jun and Alejandro. In the second half we managed to score three goals but lost with a final score of 5-3 to them. By this point Josh had been passed out behind one of the goals for a while and we all crashed down around him. By this point a team of lifeguards had pretty much cleared the beach so we took our stuff and headed back, arranging to meet the others in a few hours for food and a night out in Boryeong. Glad to be out of the orange shorts we showered, changed and met the others for 삼겹살 (Samgyeopsal, grilled pork belly). Then it was party time. We stopped at a shop for soju (because we’re classy) and then headed towards the music. Two of our number suddenly disappeared and the rest of us ended up drinking almost endless soju as we danced by a food truck with a DJ on top, sounds bad but it was really good and well set up. Josh, Mira and I crashed into bed (floor) at about 6am. 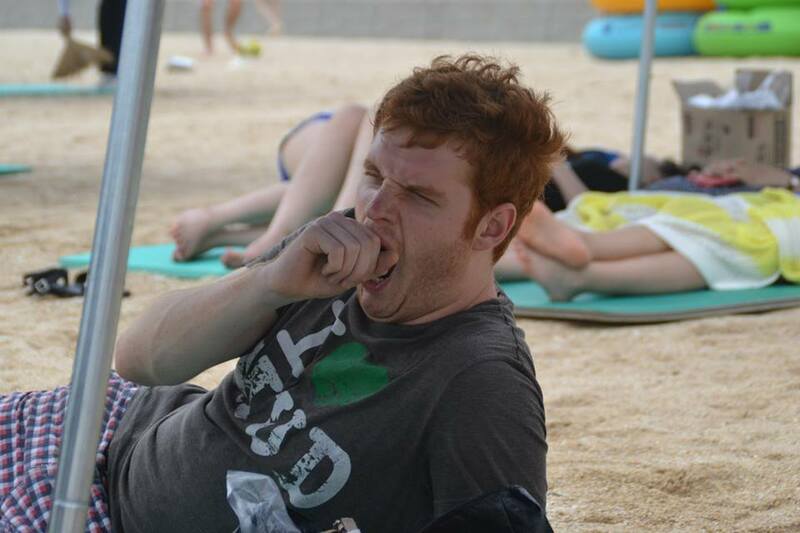 When you first drink soju the hangover takes you to a special kind of hell. I came out easy and was tired but not suffering especially. Josh looked a bit more like the walking dead. Our conditions improved a little after an hour or so on the beach with Sophie (who didn’t look at all like she’d been up until 6am the night before), Amy and Ho Jun. We challenged our hangovers and played a great game where you hold up one leg so your legs look a bit like a 4 and hop around using your knee to try and knock people over. By the time we left the beach I was almost back to normal but neither myself or Josh were normal enough for what came next. Our Korean friends, who all looked fantastic by the way, not like me and Josh who looked like we’d been awake for 20 years, decided to go to one of the fish restaurants for lunch. It looked amazing in a disgusting edible mollusc kind of way, but the sight of the giant, slimy, still-alive sea life put me right off. While our friends tucked into their feast, I held back. Josh was still shattered and decided the best thing to do would be to pass out on the concrete floor of the alley behind our table. 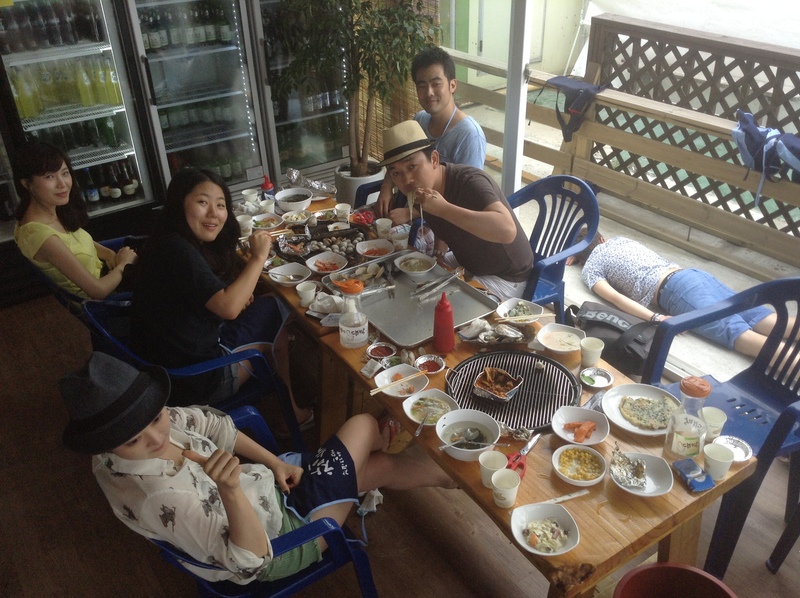 He caught the attention of some diners who saw him and informed the owner that there was a maybe-dead man lying on the floor. He came over to check but we left him sleeping. Can you spot him in the photo? After lunch it was time to say goodbye to Sophie, Amy, Ho Jun and Boryeong. The Mud Festival was awesome, but it was time to go home. This entry was tagged boryeong, mud, mud festival. Bookmark the permalink. 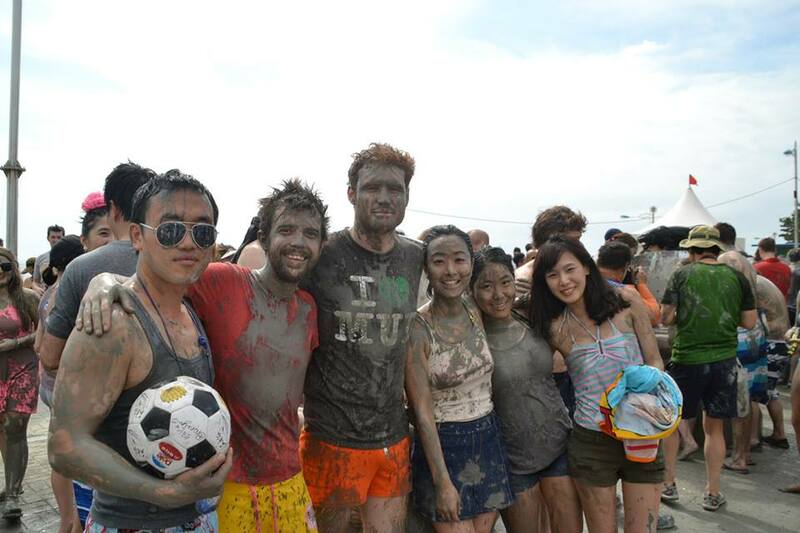 I am representing the Boryeong Mud festival organizers. During our search we came across this article. We would like to send you an invite and other information related to the festival. If you kindly share your email address with us it will be much appreciated. Thanks for reading the JamesVsWorld blog. I’m glad you enjoyed reading it and thank you for commenting. 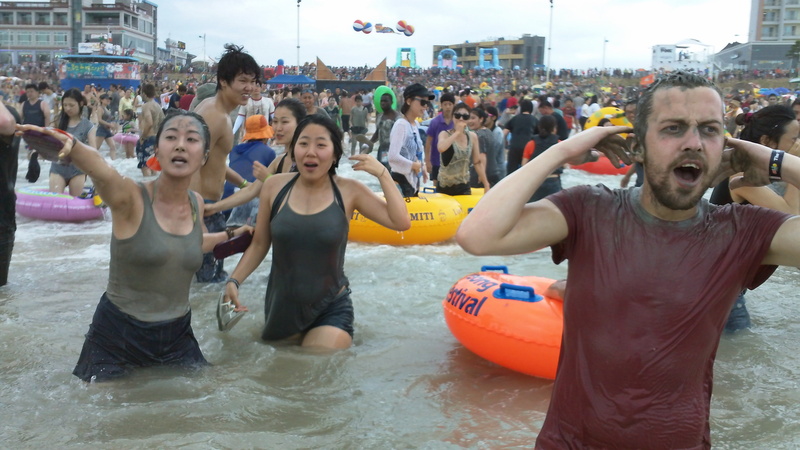 Boryeong Mud Festival was a highlight of my year.